Even though today's painting is quite simple, it is a big landmark for me. Every year, when the weather gets warm and summery, I try my hand at plein aire painting--painting outdoors. Every year I make a mess and marvel at how plein aire painters are able to pull all that information together and create such beautiful paintings. 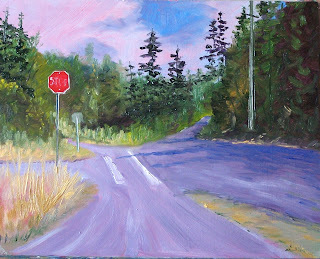 So, I've spent the past three years reading the advice of accomplished plein aire painters. I read Alla Prima by Richard Schmid several times, Composition of Outdoor Painting by Edgar Payne, Landscape Painting Inside and Out by Kevin D. MacPherson Carlson's Guide to Landscape Painting by John Carlson and several others not just once, but over and over again--taking notes and trying to absorb their knowledge. Yesterday, when the temperature had cooled to a mere 95 degrees, I sat on the back porch, in the shade and focused on the roof of my neighbors house. Somehow it all fell together. It wasn't a big mess like some of my other past attempts. So, in spite of its simplicity, this little painting pleases me. Now I can't wait to get out and try it again. Yesterday's weather broke into triple digits and was registered as the highest temperature ever on the west side of Washington State. At 103 cooling off was on everyone's mind. 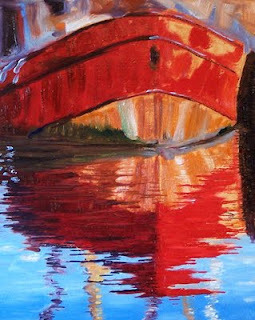 I focused my efforts by painting the reflection of this old vessel. It kept my mind off the heat and was a feast of color with the contrasting warm reds and cool blues. The painting is 8x10 inches on a hardboard panel. 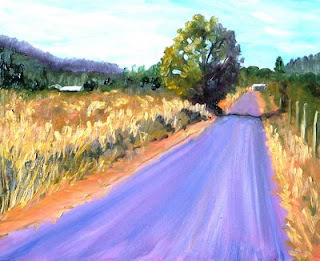 As the heat continues today, I'm contemplating painting this scene again in a much larger version. If I get it big enough, maybe I can just jump into the picture and enjoy the cool of that sparkling water. The big news in the Pacific Northwest is the weather. Temperatures in the 100's are rare and are breaking records here. Only 15 percent of homes in Washington State have air conditioning. Fans and air conditioning units are sold out in the stores, people are flocking to the air conditioned malls, libraries, and restaurants. My family is begging for a trip to the coast where the temperatures are about 20 degrees cooler. Today's little 5x7 inch oil painting was inspired by days of my youth spent fishing off the Washington coast. 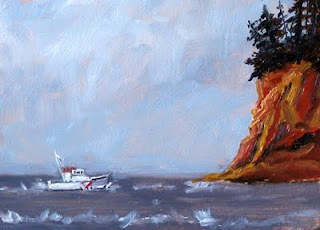 The familiar red-striped Coast Guard boat and the rugged shoreline remind me of hours of cool, damp ocean spray. Just what we all need. When this painting dries, it will be placed in the Small Impressions Gallery. Yesterday was another day of high heat. 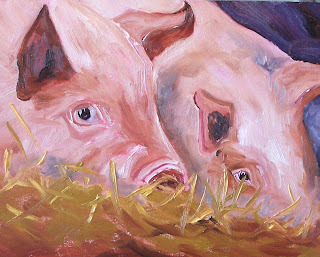 I painted in the morning and lounged like these little piglets in the hot afternoon--mostly catching up on reading and planning work on some color charts. This painting is 8x10 inches, oil on a gessoed hardboard panel. Sometimes a painting seems to paint itself, and this one was one of those. The idea of heading to the Cascade Mountains to escape the heat crossed my mind the past few days until the news announced it would be even hotter in the foothills. Usually this is the time of year when the mountain wild flowers bloom profusely and the mountains give the effect of spring once again. 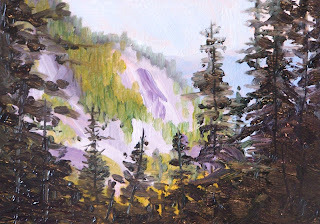 Today's 5x7 inch oil painting represents a glimpse of a Cascade Mountain side. When the painting is dry, I will place it will be for sale at Small Impressions along with some of my other small paintings. The weather this week is expected to hit a stream of record highs all in the 90's. Even though I love the summer weather, it sometimes leaves me longing for a little Pacific Northwest moisture, a more typical state of the environment here. The warmth inspired me to think cool. This 8x10 inch oil painting duplicates the misty dampness of spring and temporarily satisfies my need for a cooler moment. Today's painting is a sunny cow. 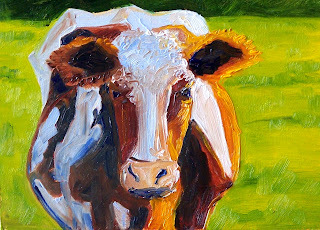 Every once in a while I get an itch to paint a cow portrait. They have curvy, quirky shapes that make creation a lot of fun. Working on this little lady, I was focused not only on her shape, but on values--the light and the dark of her coat--making sure the sunshine sparkled as she stood and posed for me. The painting is a 5x7 inch oil painting on a gessoed hardboard panel. This painting has SOLD. 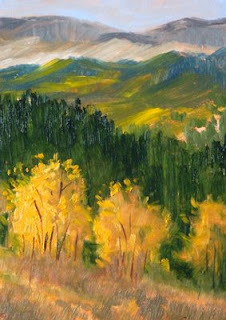 Yellow can be a challenge to work with as a painter because of its inensity. 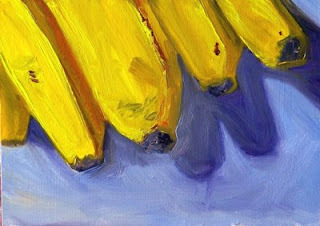 I've found one great way to practice working with it is by painting bananas. It allows me to practice the values and different hues of the color. 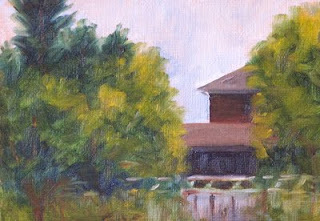 This little painting is a 5x7 inch oil painting on a hardboard panel. It is for sale at Small Impressions Gallery at Etsy for $50.00 plus $6.50 for shipping to US addresses. Another banana painting in the Gallery was completed on a black gessoed panel and is also for sale. The still life section of Small Impressions contains a number of small paintings of fruits and vegetables. Most of my small paintings are $50.00 plus $6.50 for shipping. The weather has been wonderfully sunny all week--just the kind of weather for water sports. 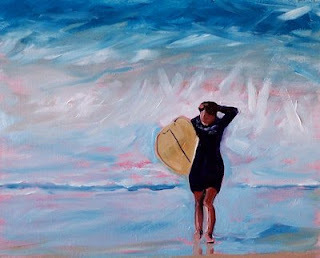 Today's painting is a celebration of the surfers in my family who like to catch a wave. It is 8x10 inches on a gessoed hardboard panel. Although the sunshine may seem to be the inspiration for this painting, it was really reading Richard Schmid's book, Alla Prima, again. He states that a painter should first strive to paint the first element perfectly and the rest of the painting will almost paint itself. With this idea in mind, I very carefully measured and mixed colors for the surfer girl, aiming for perfection. When she was completed to the best of my ability, the rest of the painting was an easy abstract conclusion. She was a great subject for a hot afternoon. The weather this week is predicted to be hot--way above average for the Pacific Northwest. I'd like to take a ride on my bike, but the temperatures are discouraging. 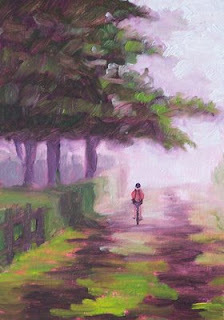 Instead, I created an imaginary early morning bike ride. A cool fog and a delightful landscape are what I want. Until the temperature drops a little I'll have to be contented with this 5x7 inch oil painting. Today's little 5x7 inch oil painting is a tribute to the coming days of autumn when the trees begin to turn and the weather chills. This painting can be purchased from Small Impressions Gallery at Etsy for $50.00 plus $6.50 for shipping to us addresses. 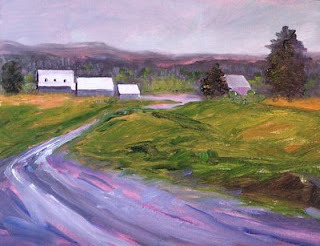 Additional $50.00 paintings are available at the gallery for an affordable collection of original fine art. Check it out! All purchases include insurance and tracking. Painting out of season was my agenda the past couple of days. I wanted a subject that spoke to me and this landscape did so. The combination of the warmth of the leaves and the cool of the autumn sky is like a small voice. I'm enjoying the summer and wish were a longer season. After all, it is the long summer days that give me opportunities to paint larger paintings, but I know the season's change isn't far off. This painting is 18x24 inches on hand-stretched canvas. 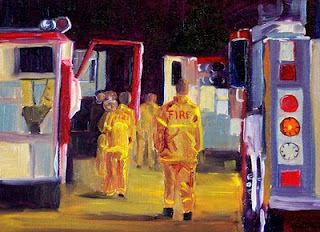 Today's painting is a 5x7 inch oil painting inspired by the fire fighters that are working so hard to keep us safe. Here in the Pacific Northwest, everything is dry. We've only had a couple of days of rain since May and the landscape has turned in to kindling. This little painting is a thank you to all those hardworking fire fighters and my best wishes for their continued safety. This week I am travelling the Washington Coast, taking excursions, and having a great time. Stopping to paint and uploading work when I can is a bit of a challenge when away from home and not in the studio, but as you can see I'm managing. 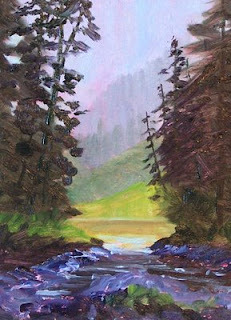 Today's painting is a small 5x7 inch oil inspired by a creek and a misty morning lake. To purchase this painting visit Impressions Paintings. $50.00 plus $6.50 for shipping to US addresses. On my bicycle trip between Orting and South Prairie, Washington, I happened upon this intersection. Five roads intersecting was an interesting little puzzle. At this point I had been riding for several hours and still had a return trip to contend with, so it was tempting to turn around and call it good. Luckily, the bike path was marked with cross walk paint inviting me forward. I continued and made it to the end within just a few minutes. Have to say I'm glad. This painting is 8x10 inches on a gessoed panel. Today I visited the Carbon River again by riding my bike along the Foothills Trail from Puyallup to South Prairie in Pierce County, Washington. The Carbon River flows out of the Carbon Galcier on Mount Rainier and joins the Puyallup River in the town of Orting. 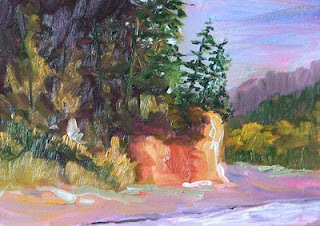 It turned out to be a beautiful day and once again, the river bed inspired my painting. This painting is an 8x10 inch oil painting on a gessoed panel. It is for sale at Impressions Gallery for $125.00 plus $12.50 for shipping to US addresses. Today's painting is a 6x12 inch oil painting on a canvas panel. It is based on a visit to a local art fair last summer. I loved the funky burrito van that parked along the road. The day was hot and the crowds were hungry. The 11th annual Art on the Ave Festival is coming up again this Sunday, July 12. There is all kinds of art, food vendors, and fun. You might even have a chance to buy a burrito from the Burrito Boy van. If you are in Pierce County, Washington, it isn't a bad way to spend a Sunday afternoon. I'm still working on inspiration from my jaunt up the Foothills Trail in Pierce County, Washington. 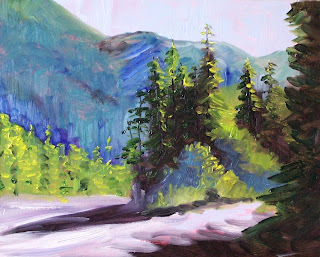 There is a portion of the trail that parallels the Carbon River which is where this painting garnered its beginning. The painting is 5x7 inches on a hardboard panel. When it has dry, I will put it in the Small Impressions Gallery at Etsy along with some of my other small landscape oil paintings. Last week I spent a wonderful afternoon riding the Foothills Trail in Pierce County of Washington State. It is a 15-mile mixed-use trail that provides a delightful bicycle ride. It begins in the town of Puyallup, winds through fertile farmlands of the Orting Valley, parallels the Carbon River, and places Mount Rainier prominently in the distance. This 8x10 inch painting was inspired by a scene at the beginning of the trek. The afternoon was beautiful and I was impressed by the warmth of the landscape and the shadow of this tree. I regret I did not take more photo references as I pedalled along. This week I'm hoping to travel the trail again. 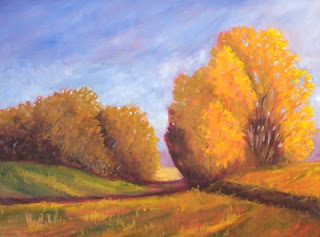 This time I will take more photos and plan to paint more of the scenery along the way.